I’ve finally found the pan of my dreams! Ha, sounds pretty funny, right? But I’m not kidding. I’ve been through quite a few “non-stick” and “non-scratch” pans that ultimately prove to be quite the opposite. After multiple uses, EVERYTHING starts sticking even after prepping with non-stick spray, and there are nicks and scratches all over them. What a waste of money! When we moved, I tossed out all of said pans so we could start anew. One of the new pans we got is the Red Copper Square Dance Pan from BulbHead and so far it’s been THE best pan I’ve ever owned. Aluminum base heats evenly with no hot spots. Cook on stovetop and in oven (safe up to 500* F). 9.5” x 9.5” x 1.75” square dimension. Smooth anti-stick and anti-scratch ceramic surface. Easy clean up and dishwasher safe. Normally when I get a new pan, I immediately toss out all the packaging and give it a good wash before using. This time around, I did something different – I. Read. The. Directions. Who the heck ever reads directions for a pan? Why do pans even have directions? If you’re buying one, I assume you know how to use it. But ya know what, I actually learned something! 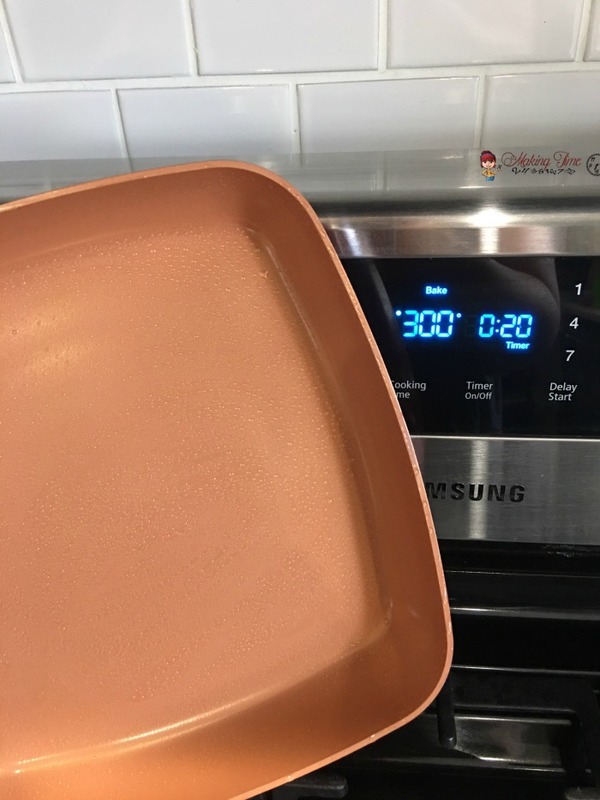 Before using the Red Copper Square Dance Pan, it is suggested that you season it. Season it? What the heck does that mean? Like when you season chicken? No, totally not the same thing. Seasoning the Red Copper Pan consists of coating the interior with a small amount of vegetable oil and placing it in the oven at 300* F for 20 minutes. I’m starting to wonder if this is where I went wrong with all of those other pans that ended up in the trash. Oops! After that it has been nothing but easy cooking with Red Copper. I’ve used it just about every day since getting it. I’ve made breakfasts of bacon, eggs and pancakes, of which I fit four pancakes in the pan at once. You can’t do that with a round pan. 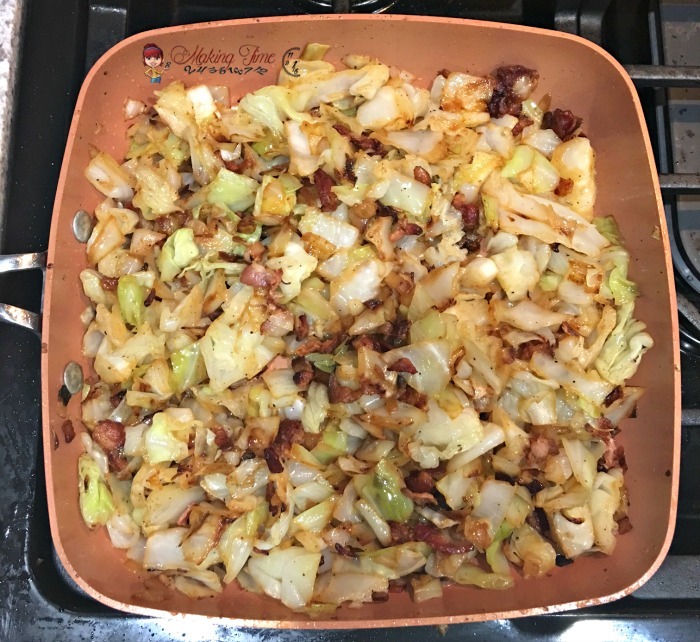 I’ve used it to make fried chicken and my new favorite dish – cooked cabbage (I’m totally addicted to cabbage these days). All the while, nothing has stuck to the pan and no metal utensils have scratched the pan. On top of that, cleanup has been as easy as wiping it clean with a paper towel. When I was done cooking (and eating), you could see remnants of bacon grease sitting atop the pan. And even though I was totally eating out of the pan while waiting for the rest of dinner to finish, there are absolutely no scratch marks from my fork. What I didn’t eat out of the pan, easily glided right onto my plate. Then all I did to clean the pan was rinse with dish soap and hot water, and wipe it down. Easy peasy! So non-stick the food dances right off! 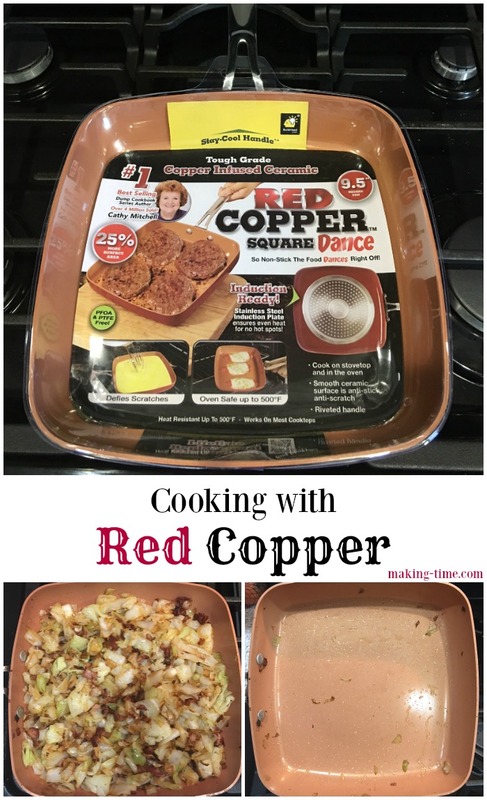 Ready to get cooking with Red Copper? The Red Copper Square Dance Pan is available online at BulbHead.com for $19.99. Red Copper even offers a lifetime replacement guarantee. So if you treat your Red Copper pan well, but at some point it doesn’t deliver, you can get a replacement and get right back to cooking. What will you cook with Red Copper? 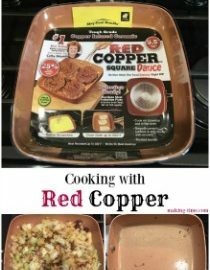 *Thank you to Marketing Maven for providing me with a Red Copper Square Dance Pan and helping me cook effortlessly again. My opinions are 100% my own and in no way influenced by the brand. Any claims or statistics should be confirmed with the brand. Please see this blog’s full policies and disclosure here. Wow.. this Red Copper pan looks hassle-free and affordable. I will check it out thanks for the review. Looks like you’ve found the perfect kitchen tool. Finding ways to simplify and reduce our time in the kitchen is always a bonus. How funny. I have pan envy. lol I love a good pot or pan thats also pretty. My teenage son loves to cook and bake. 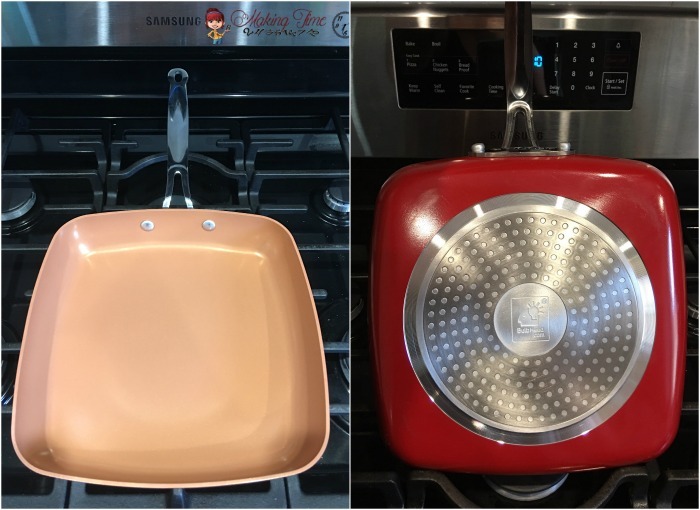 This Red Copper pan is on his list of “As Seen on TV” kitchen products he thinks we should have. We’ve purchased some kitchen products that were not easy to use or did not meet our expectations. Thank you for sharing your wonderful review. I appreciate that you pointed out to read the directions—or at least season the pan before using. I’m letting my son know we can bump the Red Copper pan up to the top of his list. 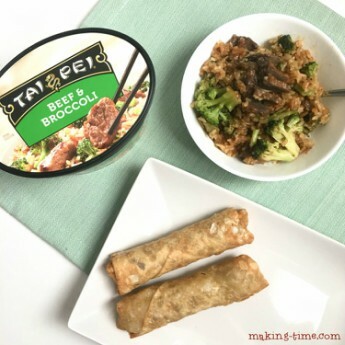 It’s amazing for fried foods! I’ve been using it for fried chicken, which is one of my family’s favs. It would also be great for burgers! I’ve been looking at this pan lately but I hadn’t bought one yet because I figured it was just going to be like every other pan. Since reading this, I may actually have to buy it now. Sounds like it works better than any other pan. Thank you. Definitely the best one I’ve had. this is what i was looking for! i have to show this review to my hubby! this looks perfect! 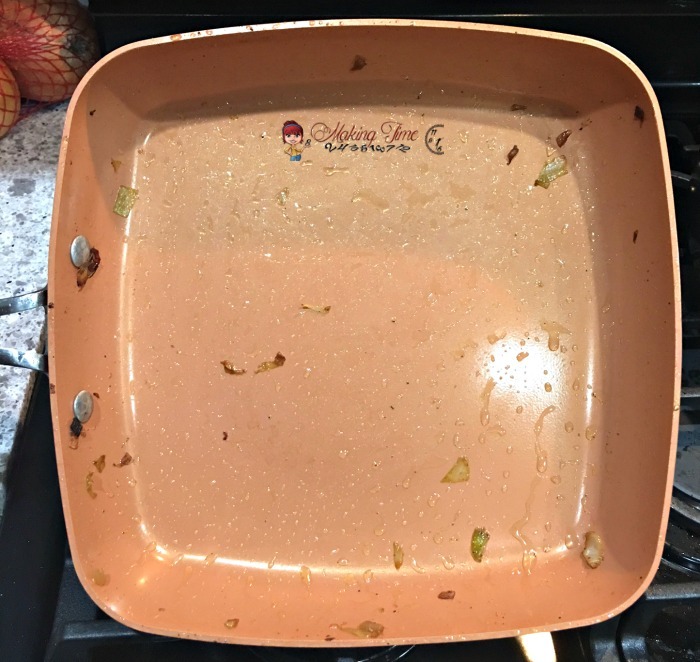 I love a nice non-stick pan. It makes everything so much easier. 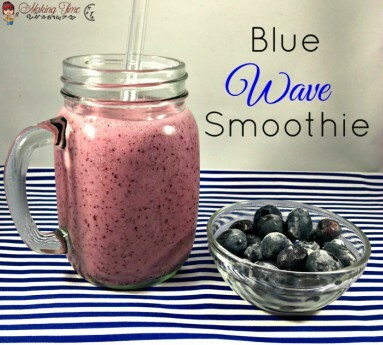 I have never seen this product before, thank you for posting about it. I will have to go to bulb head and check it out. I’ve posed this question to Red Copper and am waiting for a response. I don’t see that it would be a problem, but I want to confirm with the brand. Best kitchen invention ever, if you ask me. Love mine! Whoa I need this!! I would LOVE to get rid of our crappy teflon ones!! This is the first Ive heard of Red copper! 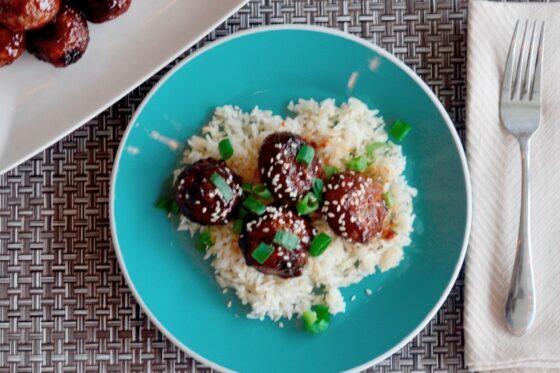 Can oil be used to fry chicken in the red copper pan? Yes! I do this all the time with mine. How do I steam cabbage in the square red copper pot? Do I put cabbage in basket and put on top of steamer? Unfortunately, I don’t own the square pot and just the pan, so I’m not 100% sure. But I have seen the pot and I think your idea would work. It appears they have steamed veggies like broccoli just on top of the steamer, but when you chop up cabbage the pieces get small enough that they’d need to be contained in something. So I think using the basket would work over top the steamer. It’s worth a shot!